The Detroit Lions’ linebackers as a group had a solid season in 2013, but they will be better this season. 1. The addition of rookie Kyle Van Noy is key. He’s strong, speedy, versatile — everything you would want in a second-round linebacker. DeAndre Levy has been moved to the weak side with Tulloch remaining at center. Expect Van Noy on the strongside and occasionally to line up on the defensive line. 2. Backup guy like Ashlee Palmer, Tahir Whitehead and Travis Lewis should be another year wise and another year better. They need a solid group to back up the starters. 3. Bill Sheridan is the new linebackers coach. This is the position he excels in. He’s developed young guys around the NFL. He was one of Caldwell’s best hires. Win now is the motto. Sure Detroit Lions fans have heard that before, but this time it’s different. They have the talent and a new coaching staff. Time is running out. 1. While the Lions are trying to put the collapse of 2013 behind them, it is there. The offense was a big reason they lost six of their last seven games. It was not all on Stafford, but certainly part of it was. He’s got to prove he can put points on the board when it counts the most. 2. The new staff has experience with coaching Peyton Manning and Drew Brees. They’ll use that expertise to fine-tune Stafford’s game. It’s up to him to make it work. Jim Caldwell and Joe Lombardi have made it clear that they did not think Stafford was “broken” and he wasn’t an interception machine. They are confident they can help his game. 3. This offense is loaded with talent. Stafford knows that and he knows it’s up to him, in large part, to make it work. 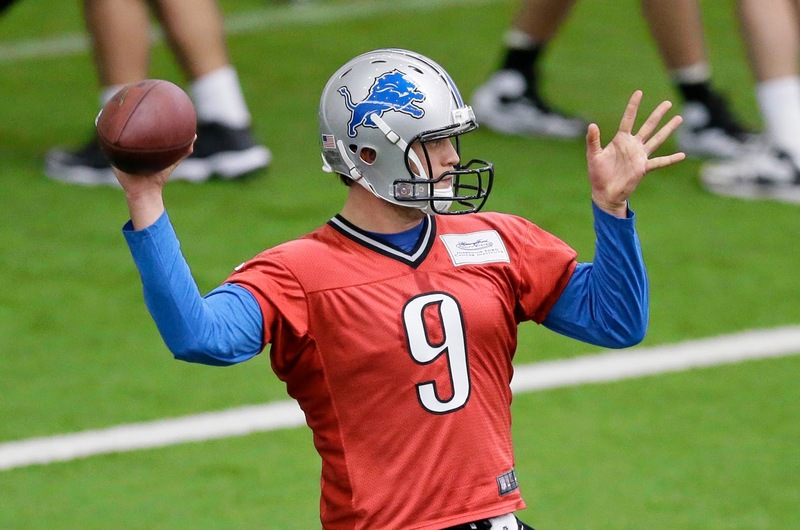 It’s tough to learn a whole new system with all new terminology but Lombardi has said more than once that he has found Stafford to be “remarkably bright.’’ Stafford is up to the challenge. 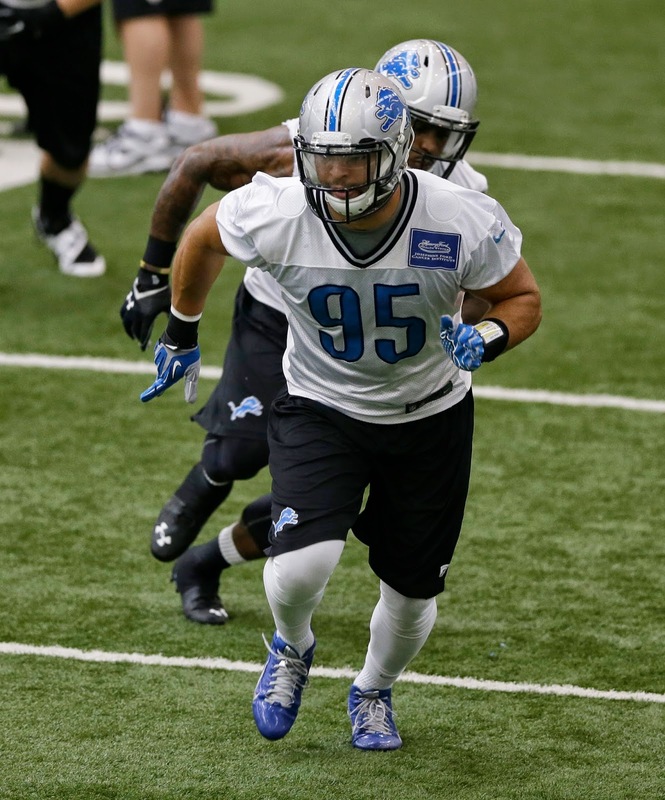 Kyle Van Noy could very well be the Detroit Lions’ rookie of the year. Putting too much pressure on him? Nah, he can handle it. Here are three reasons the pass-rushing linebacker will be a standout as a rookie. 1. With DeAndre Levy shifted to weakside linebacker and Stephen Tulloch in the center, Van Noy has been lining up at the strongside position with the starters. Keep in mind, these coaches don’t give the rookies first-team reps unless they earn them. 2. He’s smart and also versatile enough to line up at defensive end in certain packages. 3. He’s solid at 6-foot-3 and 243 pounds. He’s what you call a football player. He impressed through OTAs and minicamps. 1. The starters will return. The only question is at right tackle. Corey Hilliard earned the start out of training camp last year but was injured in the first game so LaAdrian Waddle took over. One of them will be the starter this year. Both are young and only getting better. 2. Center Dominic Raiola is back and he is pumped. He was robbed of a Pro Bowl berth last year, he was that good. He seems even more motivated this season. He plays a huge role as a leader for the mostly young line. 3. Riley Reiff has a solid first season as a full-time starter. He’s only going to get better. That goes for Waddle and right guard Larry Warford too. Everyone expects the best from rookies Eric Ebron, the first-round pick, and Kyle Van Noy, the second-round draft pick. But there are undrafted rookies who could step up like Joe Fauria and LaAdrian Waddle did last year. 1. Fullback Chad Abram has been a pleasant surprise. He’ll have to win the battle with veteran Jed Collins, but don’t count him out. Abram attended Florida State, alma mater of general manager Martin Mayhew. 2. Tackle Cornelius Lucas is a standout because of his size. He’s 6-foot-9 and 328. Not sure he’s ready for a backup role this season, but he could be placed on the practice squad to develop. He was undrafted out of Kansas State. 3. Kalonji Kashama out of Eastern Michigan is a 6-foot-4 defensive end with NFL bloodlines. Two of his brothers played in the NFL and CFL while his cousin Tim Biakabutuka was a running back at Michigan and for the Carolina Panthers. He could be a project, possibly a practice squad player. Rodney Austin was undrafted coming out of football powerhouse Elon. But his growth has been no joke. 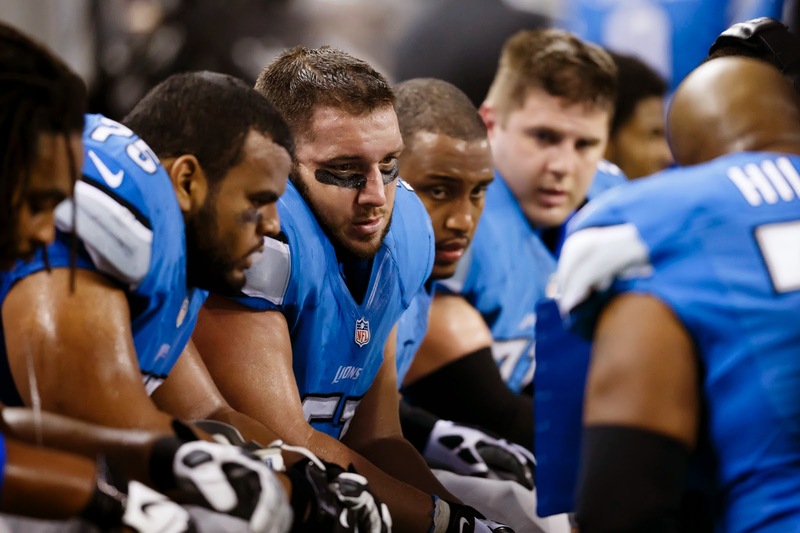 The offensive lineman was signed by the Lions after the 2012 draft and spent that season on the practice squad. He played in one game in 2013. 1. He’s versatile with the ability to play center and guard. This is key. It’s unlikely he’ll be a starter this season, but the Lions will have seven active offensive linemen on game days — five starters, a backup tackle and a backup guard/center. With Dylan Gandy gone, that backup role should fit Austin. 2. His future is bright and eventually he could win a role as a starter. 3. Jim Caldwell likes him. “Rodney’s smart. Rodney’s tough. Rodney’s a good leader and he has skills and ability. (He is) a strong and powerful guy. He’s developing,’’ Caldwell said. 1. He’s a veteran (six NFL seasons) and a leader. Ihedigbo — many of his teammates call him Dig — takes that responsibility seriously and can help the young defensive backs. When he was with the Baltimore Ravens he learned from the best — Ed Reed and Ray Lewis. He won a Super Bowl ring with the Ravens two years ago so he knows what it takes to get to the top. 2. Ihedigbo, 30, played in all 16 games each of the last two seasons for the Ravens. 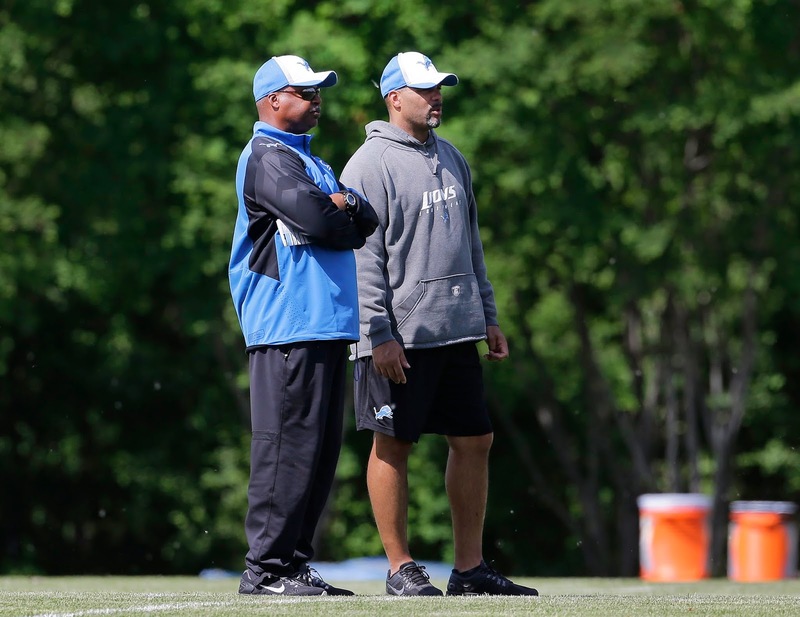 In 2013 he started all 16 games under defensive backs coach Teryl Austin who is now the Lions defensive coordinator. 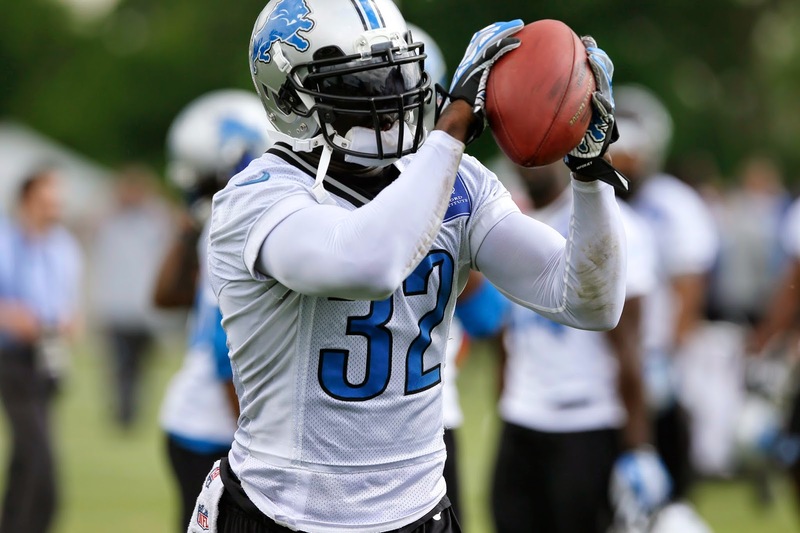 While the Lions’ defense may be new to most guys, Ihedigbo should have a certain familiarity with it. 3. He’s penciled in as a starter opposite Glover Quin. They haven’t had much time to practice together on the field because Quin has been held out following ankle surgery. But the two work out in Houston in the offseason and should pick up playing together during training camp. Hopes were high for cornerback Darius Slay when he was drafted in the second round in 2013. He started the first two games last season but was benched early. That doesn’t mean he is a failure, cornerback is one of the toughest positions to master in the NFL. 1. 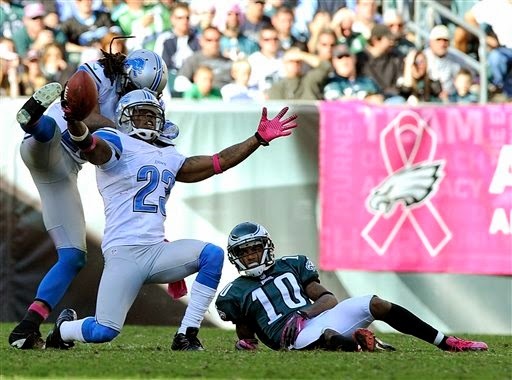 Cornerback is always a problem position for the Lions like it is for many other NFL teams. This season is no different. The Lions have numbers, but they’re counting on Slay to develop into a starter — sooner rather than later. This is especially important with Chris Houston gone. 2. Slay was a second-round pick. The Lions saw something they liked in him at Mississippi State. He has to bring his college game up to the NFL level. They need value for that pick. 3. Slay’s looked better in the offseason and minicamp which is a good sign. It’s a new defense and he has a new coach in Tony Oden. This is Slay’s time. While we’ve gotten familiar with Detroit Lions coach Jim Caldwell and his coordinators Joe Lombardi and Teryl Austin, he’s also brought in other assistants who play big roles. 1. Linebackers coach Bill Sheridan was the linebackers coach for the New York Giants when they won Super Bowl in 2007 where he helped develop Antonio Pierce into a Pro Bowler. He spent the last two seasons in Tampa Bay as the defensive coordinator. He helped the Bucs run defense go from last to first in the NFL in 2012. There he helped develop linebacker Lavonte David and defensive tackle Gerald McCoy. Sheridan’s experience should benefit young linebackers like Kyle Van Noy, Tahir Whitehead and Travis Lewis. 2. Defensive backs/cornerbacks coach Tony Oden comes from the Tampa Bay Bucs where he played a big role last season in the development of rookie Johnthan Banks. He also coached for the Saints and won a Super Bowl ring when the Saints beat the Colts (coached by Jim Caldwell) in Super Bowl XLIV. The Lions have young cornerbacks that need to be brought along. 3. Quarterbacks coach Jim Bob Cooter has worked extensively with Broncos quarterback Peyton Manning. Cooter and Caldwell worked together with the Colts. Cooter is highly respected and the Broncos wanted to keep him. But there he was an offensive assistant so the move to Detroit was a promotion for him. He’s coached in two Super Bowls — Broncos in February and Colts in XLIV, but is still looking for a ring. Obviously he’ll work closely with Matthew Stafford who, like any quarterback, can improve his game. 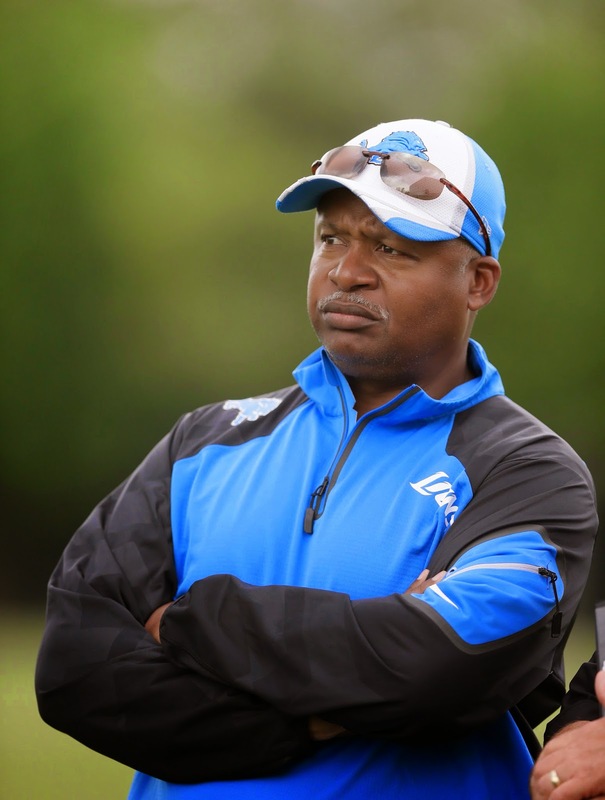 Coach Jim Caldwell has brought a new attitude to the Detroit Lions since he was hired in January. Here are three differences apparent at practices. 1. Caldwell is not a yeller. The offense and defense are learning new schemes so practices — especially the early ones — were not always smooth. He maintains his calm demeanor. His theory is players eventually tune out a coach that consistently yells. If he changes his delivery, they know he means business. 2. When a player makes a mistake, the play is not repeated. They move on to the next step. The player is held accountable just like they will be after games. He’s expected to learn from the mistake and not repeat it. Caldwell said the number of mistakes has gone down as the offseason wore on which is what he expected. 3. He’s brought in “ladder cam.” A rolling ladder of sorts is set up behind the quarterbacks and the videographer on it follows just the quarterback from an overhead view. It’s a method used to correct any mechanical errors and on film they can see exactly what the quarterback sees from the defense. It’s not a new phenomena (Caldwell has used it since 1982), but it’s new to these Lions. (Follow @PaulaPasche on Twitter. Order her book, “100 Things Lions Fans Should Know & Do Before They Die’’ here. It’s also available at bookstores. Everyone knows Golden Tate, but he’s not the only new Detroit Lions player who will be impressive this fall. 1. Cornerback Cassius Vaughn is 26, has 54 games of NFL experience with the Broncos and Colts. So far looks like a good fit in the secondary. With Chris Houston released, Vaughn could ease his way in. He’s an excitable, vocal guy on the field. 2. Defensive end Darryl Tapp played on the Seahawks when he was a rookie and defensive coordinator Teryl Austin was an assistant. Austin was one reason the veteran wanted to play for the Lions. He was miscast as a linebacker last season with the Redskins in a 3-4 scheme— has always played at defensive end. His 267 games of experience could be invaluable. 3. Kicker Giorgio Tavecchio nearly won the job at Green Bay Packers training camp last summer over Mason Crosby. Yes, the Lions drafted a kicker (Nate Freese) in the seventh round, but this will be a huge competition at camp and in the preseason. 4. Safety Isa Abdul-Quddus played in 42 games for the New Orleans Saints from 2011 to 2013. When he was cut in January, the Lions grabbed him. The Lions also signed James Ihedigbo and he will probably start at safety with Glover Quin, but Abdul-Quddus could add depth. 5. Chad Abram is one of two fullbacks on the roster, along with Jed Collins who played with the Saints which gives him a connection with offensive coordinator Joe Lombardi. Abram, an undrafted rookie out of Florida State, has been impressive and could push Collins for the job. Take Chris Houston out of the Detroit Lions’ cornerback equation. The team announced on Friday that his contract had been terminated. 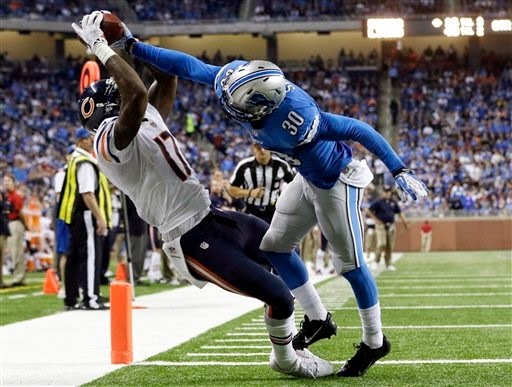 It seems cornerback is always an issue for the Lions and it was expected that Houston would return to be a starter. Not now. This will be a key position battle during training camp. Darius Slay, Rashean Mathis, Cassius Vaughn and Bill Bentley probably have the best chances of being a starter. Slay has looked good in minicamp and the OTAs. The new coaching staff has praised him. He earned the start out of training camp last season, but was benched in each of the first two games. Mathis then became the starter alongside Houston. The 33-year-old Mathis looks in midseason form and could be the best option at cornerback. Vaughn, who was signed as a free agent, is entering his fifth NFL season. He spent the first two with the Broncos and the last two seasons with the Colts. He played in all 16 games in 2012 and 2013 with 15 starts total. Bentley played in 13 games with five starts for the Lions in 2013. He seemed most effective at nickel. The Lions drafted Nevin Lawson in the fourth round, but cornerback is one of the toughest positions to learn in the NFL so it's unlikely he will be ready to start. The mystery surround Chris Houston has been solved. 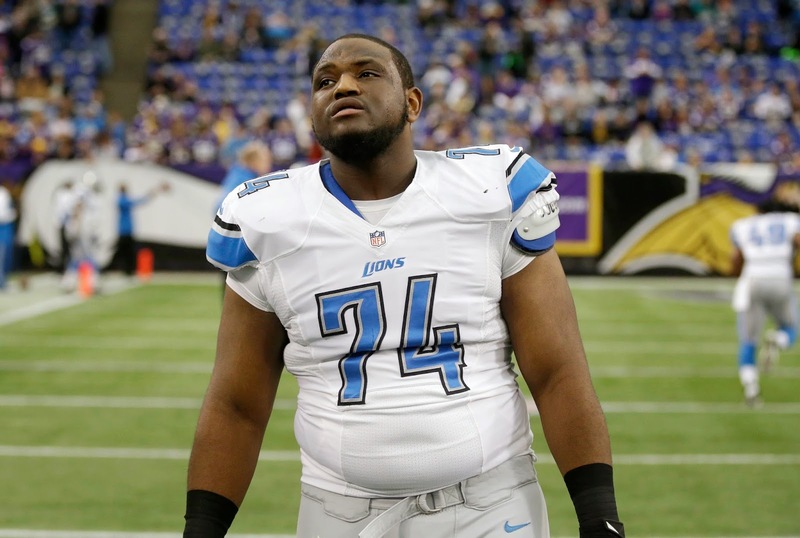 Houston’s contract was terminated, according to the Detroit Lions' web site. He had four years remaining on a five-year, $25 million deal signed in March 2013. That termination gave the Lions enough salary cap space to sign first-round pick Eric Ebron. Houston had not been with the team for several weeks following toe surgery including this week’s mandatory minicamp. Coach Jim Caldwell said this week that Houston had been excused. The coach got a little prickly when asked if Houston was behind on learning the new defense. Houston was traded to the Lions in March 2010 from the Atlanta Falcons. His best season in Detroit was in 2012. He struggled with consistency throughout the 2013 season. It was expected he would start this season. 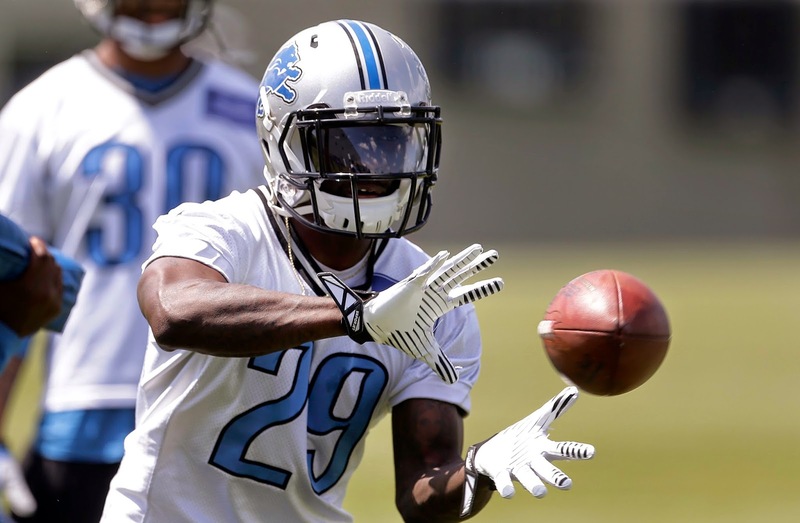 Finding starting cornerbacks will be one of the battles in training camp with Darius Slay, Rashean Mathis and Cassisu Vaughn as the ones to watch. Detroit Lions first-round pick Eric Ebron signed his contract on Friday. The tight end announced it on Twitter. Ebron is the last of the Lions’ eight draft picks to sign. According to the Lions, it’s a four-year deal. The tight end, who played at North Carolina, has been at every workout since he was drafted. 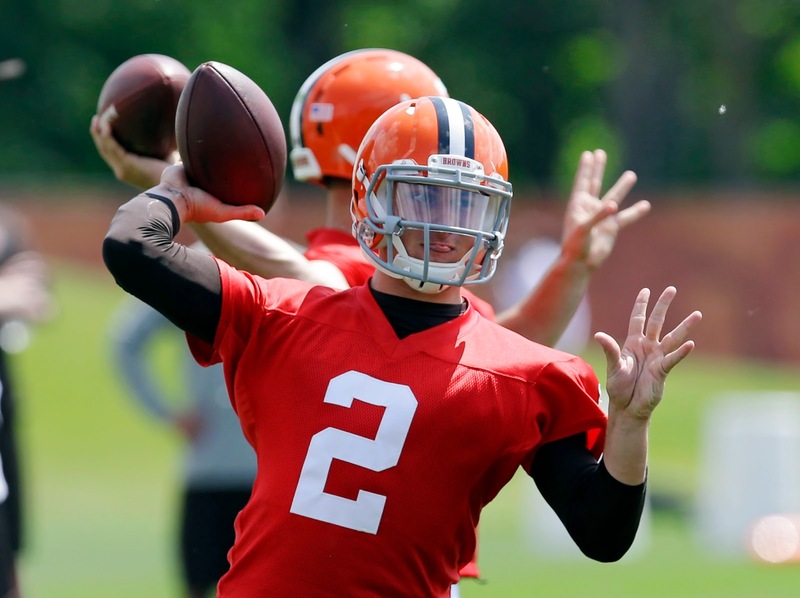 He admitted that it’s been tough to learn the offense, but he is improving which was evident at the three-day mandatory minicamp this week. 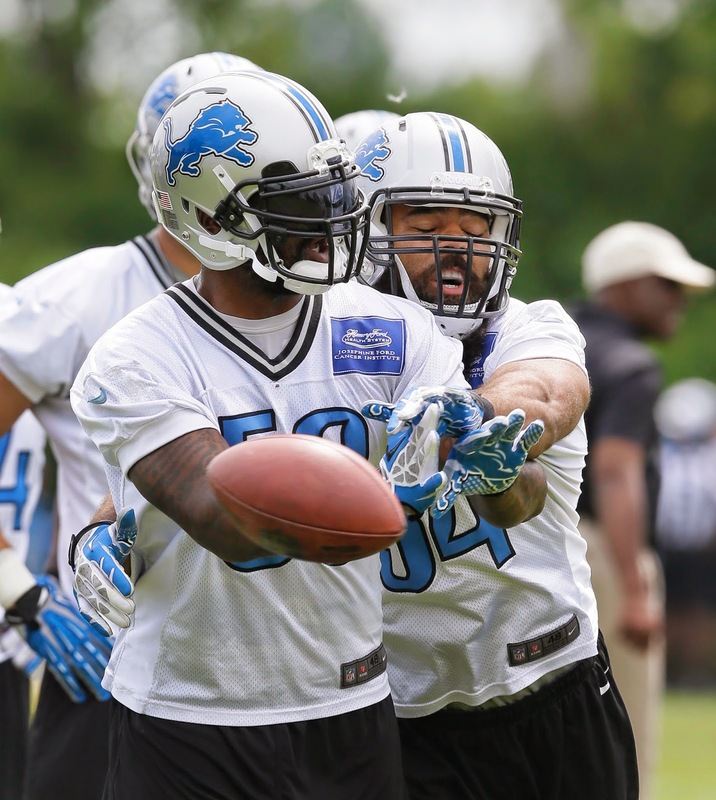 The Lions wrapped up their mandatory minicamp on Thursday. The players are off until they report for camp on July 25. 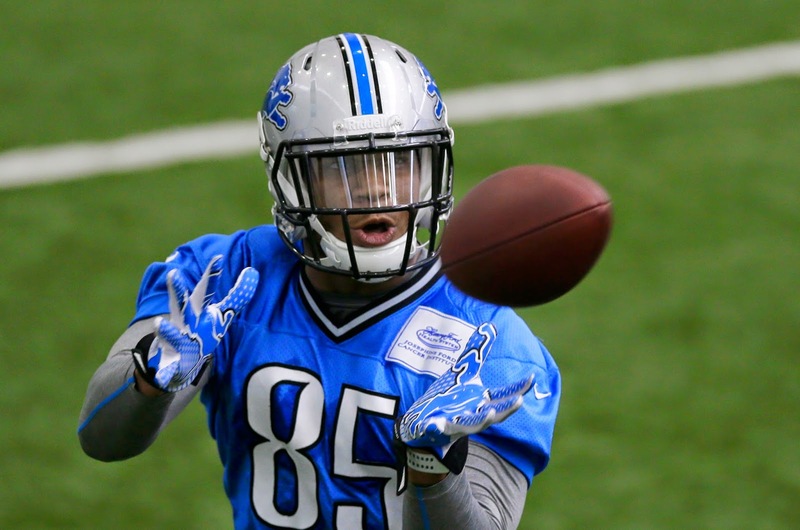 ALLEN PARK — Eric Ebron is starting to look more like a first-round pick. The Detroit Lions tight end is not any different from most rookies. Taking the field with NFL veterans can be a challenge initially. The coaches can see him getting a little more comfortable and so can his teammates. 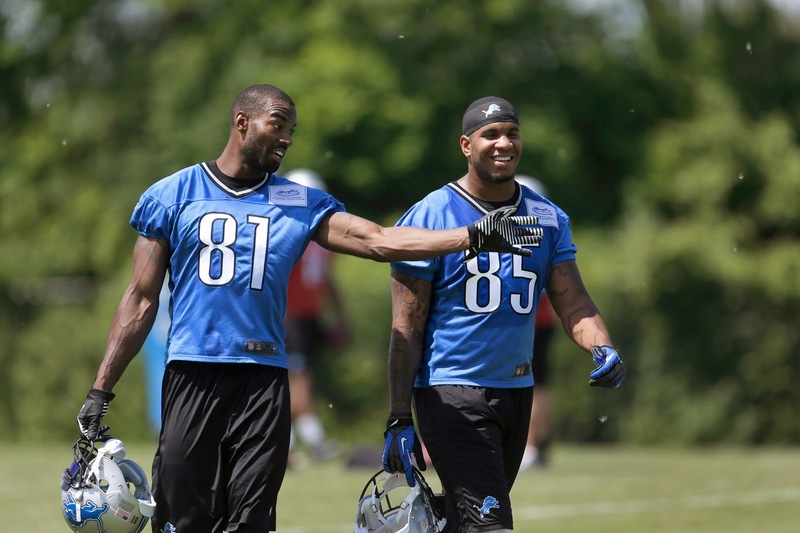 While he’s a tight end, he’s getting mentoring from wide receiver Calvin Johnson. The Lions wrap up their three-day mandatory minicamp on Thursday. The players will be off until training camp starts in late July. Get inside look at Wednesday's action in photo gallery. If you missed Thursday's chat discussing the Detroit Lions, check out the transcript here. Much discussion on what players looked good in minicamp and status of Ndamukong Suh's contract extension talks. Next chat on Thursday, July 24, just before the start of training camp. ALLEN PARK — For the most part since Jim Caldwell has been hired, we’ve heard him speak but haven’t seen him coach much. With the three-day mandatory minicamp, which started on Tuesday, that is beginning to change. Caldwell, unlike Jim Schwartz, is not a screamer. He said he’s not always even keeled. “I’m passionate about what I do, even in terms of practice. 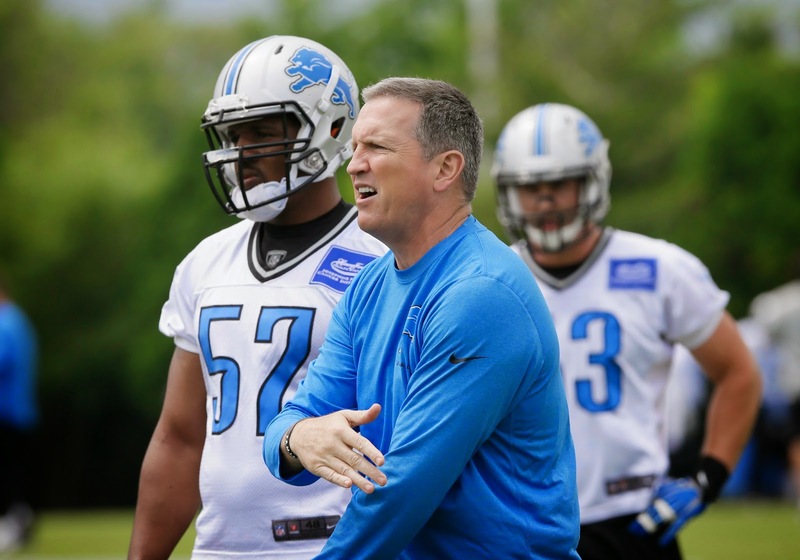 What I feel really is that I do instruction in the classroom, I do instruction when we have our team meetings and I tell them what I want,’’ Caldwell said. Day Two of mandatory minicamp begins at 3 p.m. on Wednesday. ALLEN PARK — After a rough start a few weeks ago in Organized Team Activities, the Detroit Lions offense has found a rhythm. It’s not a finished product, but it’s much closer. “We’ve taken big steps from last month,’’ center Dominic Raiola said. That’s how it looked during Tuesday’s opening day of the three-day mandatory minicamp. “It felt great, personally for me I’ve been through every offense you can be through,’’ Raiola said. “It’s a work in progress for a lot of people. a lot of people have only known one thing — Scott (Linehan’s) offense for years. Our expectation level is really high, we expect everybody to pick it up. “I think we’re in a good place right now. I like where we’re at,’’ Raiola added. While the offense looked better than the defense on Tuesday, Caldwell said it’s a fluctuating matter. 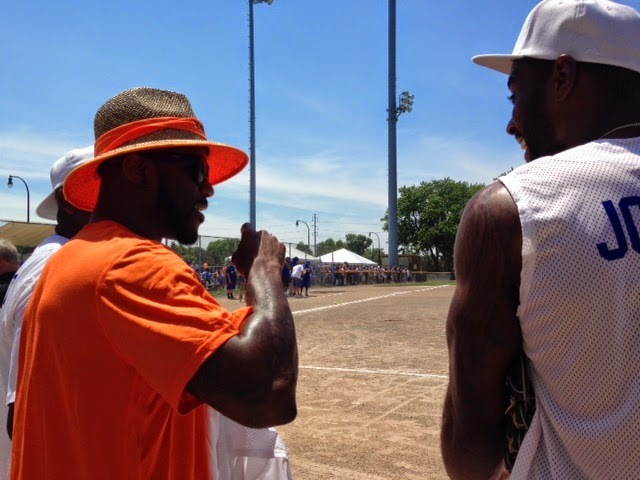 DEARBORN — Nate Burleson will always carry a little bit of Detroit in his heart, but after four seasons with the Detroit Lions he’s now a wide receiver for the Cleveland Browns. And, the Browns will be at Ford Field in August for the opening preseason game. Burleson, who attended the Lions charity softball game on Saturday, just laughed when asked if he’d thought about that game. “Are you kidding me? I’m wracking my brains to figure out what celebration I’m going to do because I’m going to get a fine. I’m going to get a fine. Period,’’ Burleson said. “I’m going to go to my coach to say, ‘hey, I’m going to get a fine, it’s going to be something crazy.’ it’s going to be a little bit of an appreciation celebration to the fans and the city of Detroit. It’s also going to be a poke in the back saying you should have kept me because I’m still balling. Burleson’s playing time for the Lions was limited in 2013 after he broke his forearm in an incident involving hot pizza on his passenger car seat. In 2012 he was limited when he broke his leg in a Monday night loss at Chicago. He said he kind of knew last year was going to be it in Detroit. “Unfortunately, it’s part of the game. I was OK with it, I was ready to walk away from the game after 11 years and start the next chapter ...’’ Burleson said. He looked into broadcasting work, but then a few teams called. “I’ve always told myself if I can still get open I’m still going to play,’’ Burleson said. “I’m going to be 33 in August I had some concerns thinking can I go out and compete at a high level with some of these guys who are a decade younger than me? First couple days of OTAs, we get to one-on-ones, I get busy, thinking to myself, ‘I still got this.’ This is what I do, I catch the ball move the chains,’’ Burleson added. 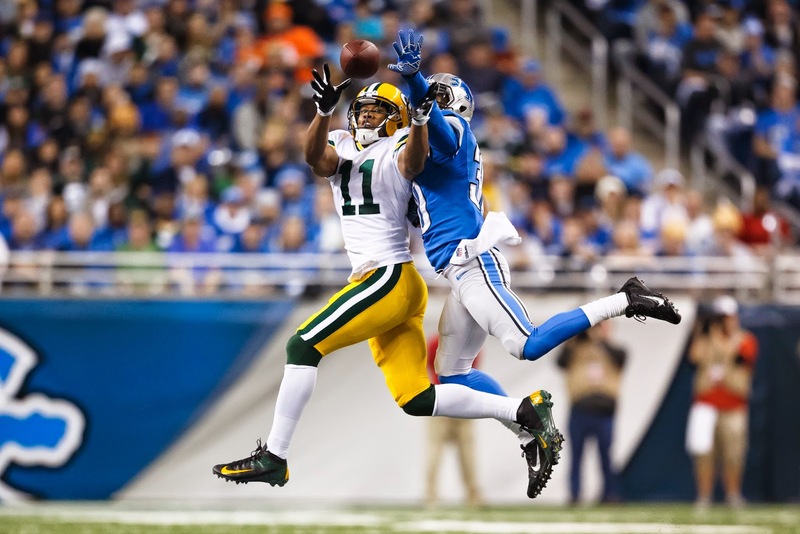 He met Golden Tate on Friday night and had nothing but praise for the Lions’ new No. 2 wide receiver. 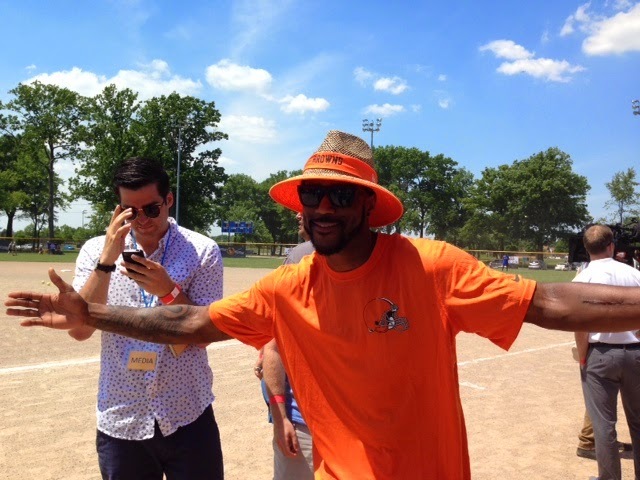 Burleson — attired in Browns’ orange shorts, shirt and even hat — received a warm reception for Lions’ fans at the charity game that benefited Detroit Public Schools. Burleson was in town for the weekend. “People they were giving me some type of reception as if I got out of jail or something,’’ Burleson said. “My teammates, from the airport, every place I went, they’re like ‘I’s good to see you, we’re sad you’re gone. DEARBORN — Nate Burleson, former Detroit Lions wide receiver now with the Cleveland Browns, said quarterbacks Matthew Stafford and Johnny Manziel have something in common. “They’ve very different. The one thing they are quite comparable in, is they’re quietly cocky which is a great characteristic to have at the quarterback position,’’ Burleson said on Saturday prior to the Lions charity softball game benefiting Detroit Public Schools. Burleson said NFL quarterbacks need to have that inner quiet cockiness. Manziel, aka Johnny Football, was the 22nd overall pick in the draft last month. He’s competing with Hoyer (Michigan State) for the starting position. 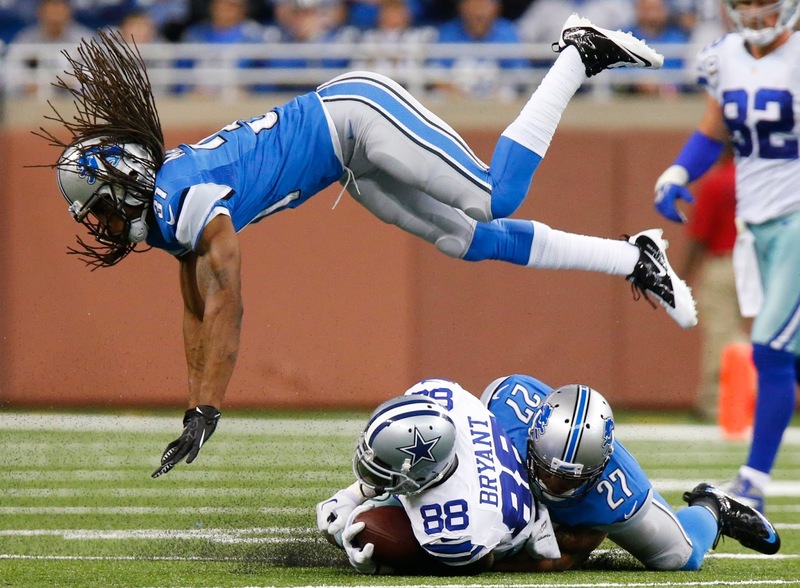 Burleson, 32, was let go by the Lions after four seasons and signed as a free agent by the Browns. Kyle Van Noy, the Detroit Lions’ second-round draft pick, signed a contract on Wednesday. That leaves Eric Ebron, the first-round pick, as the only drafted rookie who has not been signed. Since the new collective bargaining agreement was signed in 2011, signing rookies is no longer a big issue for NFL teams. Van Noy, who wears No. 95, is a hybrid pass rusher who works out with the linebackers and lines up at defensive end. It’s a big week for Van Noy. He’s getting married to former Miss Utah Marissa Powell on Saturday. Honeymoon plans likely include next week’s mandatory minicamp, Tuesday-Thursday. If you missed Thursday's live chat on the Lions, check out the transcript here. We talked about a little of everything as the OTAs wrapped up. Next up will be the three-day minicamp starting on Tuesday. Join the next chat at 3 p.m., Thursday, June 12. The Lions announced four roster moves on Monday including the release of defensive tackle Vaughn Martin who they signed as a free agent in March. Martin was a starter in San Diego in 2011 and 2012, but was released by the Miami Dolphins in November following hernia surgery. When he was signed, it was expected that he would back up Ndamukong Suh and Nick Fairley. Defensive end Kourtnei Brown, who was claimed off waivers from the Buffalo Bills in April, was cut on Friday. Replacing them on the roster are wide receiver Cody Wilson and defensive end Kalonji Kashama. 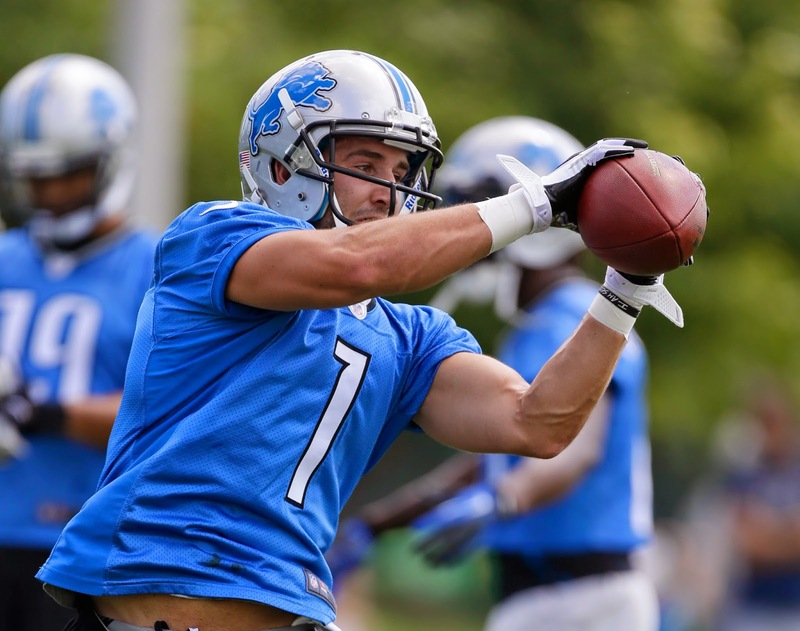 Wilson, who played at Rochester Adams and Central Michigan, was on the Lions’ practice squad last season. He was released on May 12 following the draft. Wilson's father, Dave, is the team's long-time chaplain. 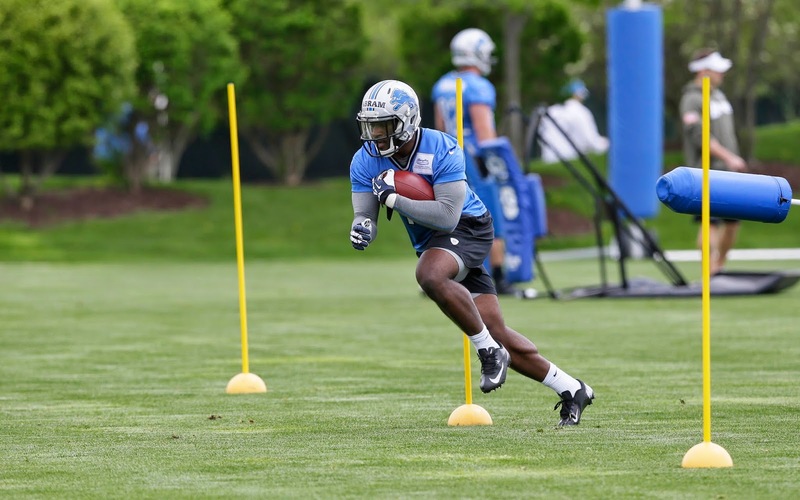 Kashama, who started for three years at Eastern Michigan, took part in the Lions’ rookie camp in May. He is from Brampton, Ontario.